• Get 10% off all ties and bow ties in the BraveGentleMan shop and look super snazzy at your holiday parties. From organic cotton corduroy to a handsome red gingham, these ties are made locally in NYC with sustainable textiles. Enter Code: handsomeholiday at checkout to get your 10% off! 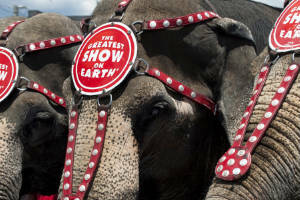 The U.S. Department of Agriculture has slapped the parent company of the "Greatest Show on Earth" with a record penalty for alleged animal rights violations. Feld Entertainment Inc., which produces the Ringling Bros. and Barnum & Bailey Circus, has agreed to pay $270,000 for allegedly violating the Animal Welfare Act on several occasions from June 2007 to August 2011, according to a USDA news release. The USDA can levy fines of up to $10,000 per violation of the act. "This settlement sends a direct message to the public and to those who exhibit animals that USDA will take all necessary steps to protect animals regulated under the Animal Welfare Act," Agriculture Secretary Tom Vilsack said in the release.